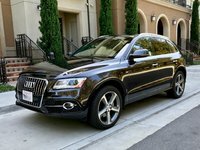 CarGurus has 11,557 nationwide XC60 listings starting at $4,000. Crossovers make up the hottest vehicle segment on the market, with every automaker getting in on the popularity of vehicles that mix the utility of an SUV with the car-like driving mannerisms of a sedan. How does a vehicle stick out in such a competitive setting? In the case of the 2017 Volvo XC60, it does so with impressive comfort and safety technology wrapped in an extremely fetching package. 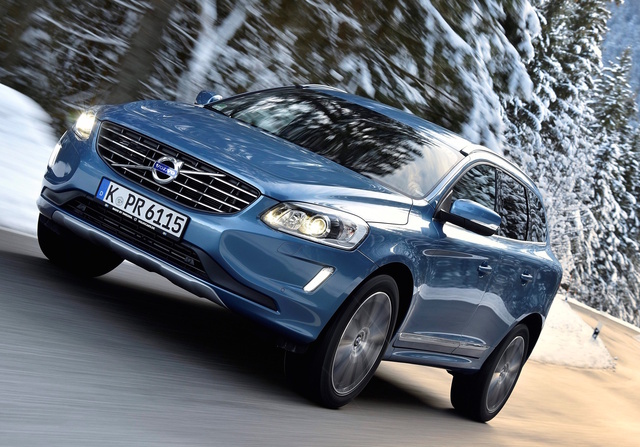 The XC60 rides on the Volvo P3 platform, which is shared with the V70 wagon and S80 luxury sedan. This ensures a comfortable, car-like ride. The XC60 first arrived for the 2009 model year, a bright spot in a dark time for the auto industry. It took familiar Volvo cues like the diagonal-line grille and elongated taillights and grafted them onto a flowing, athletic silhouette. This attractive styling positions it well to compete with rival small SUVs like the Audi Q5, BMW X3, and Mercedes-Benz GLC-Class. Standard exterior features include rain-sensing wipers, power heated mirrors, front and rear skid plates, and black roof rails. You can upgrade the XC60 with impressive features for usability year round like a heated windshield, heated windshield washer nozzles, and a power rear liftgate with programmable memory settings. For the more performance-oriented, the R-Design trim features a color-matched body kit with added aerodynamic components, unique wheels, a stiffer chassis and suspension damping, and other unique touches. From day one, the XC60 delivered an impressive interior aesthetic that is still one of the most visually pleasing today. The clean dash features a single digital screen capping a center console that floats freely up from the shifter, allowing for additional space. Standard equipment on the XC60 includes a leather-wrapped steering wheel with audio controls, dual-zone electronic climate control, 40/20/40 split-folding rear seats, 8-way power adjustable front seats, and a high-performance 8-speaker sound system with iPhone and USB connectivity. The XC60 comes with Sensus, Volvo’s infotainment system. It features apps like Yelp, WikiLocations, Pandora, local weather and search, and can even turn the XC60 into a Wi-Fi hotspot. The navigation system has 3D imaging and even apps like Find Parking. You can also plan your journey on another device and send it to the navigation system. The XC60 can be had with a rear-seat entertainment system that includes dual seat-back LCD screens, a DVD player, wireless headsets, and remote controls. With the rear seats up, the XC60 provides 30.8 cubic feet of cargo space. Fold those seats down and the XC60 has 67.4 cubic feet of highly usable cargo space, which Volvo claims is a class-leading figure. The XC60 is available with one of two 4-cylinder engines, though you might not know it from the trim names. The T5 uses a 2.0-liter turbocharged inline four making 240 hp. The uprated engine comes in the T6, which is not a 6-cylinder engine. It has a turbocharger as well as a supercharger–-called “twin charging”–-and makes 300 hp. An 8-speed automatic transmission routes power to the front wheels or to available all-wheel drive (AWD). In past years, you could only get the T5 with front-wheel drive, but it's now available with AWD as well. As for fuel economy, the T5 returns 23 mpg city/30 highway/26 combined. The T5 AWD gets 20/29/23, and the T6 AWD returns 20/27/22. The XC60 is not a performance machine like models such as the X3 or GLC-Class, but there is a solid feel while driving it. The steering is not overly taught, but the solid construction leaves the driver and occupants with an overwhelmingly secure feeling, underscoring the XC60’s safety credentials. Volvo’s defining attribute has long been its safety standards. Volvo now delivers especially high-tech safety equipment, including forward-collision warning with pedestrian detection that can even automatically brake at certain speeds. The XC60 also features blind-spot warning, lane-departure warning, and automatic adaptive cruise control. An available forward-view camera provides heightened awareness while pulling in or backing out at low speeds. The 2016 XC60 earned a 5-star overall safety rating from the National Highway Traffic Safety Administration and an overall score of Good from the Insurance Institute for Highway Safety, including a Top Safety Pick+ accolade. Base MSRP for the 2017 Volvo XC60 is $40,950 for a T5 trim; add AWD and the price increases to $42,950. A T6 starts at $46,350, while a T6 R-Design starts at $51,000. What's your take on the 2017 Volvo XC60? floyd I'm in love with mine, a versatile and good every day driver, the safety is the best feature, and with cell phone integration and the use of my bluetooth gives me hours of music and podcast. The seats are so comfortable to long hauls with great storage space, this is a must look at when considering a suv. cshannon1077 Love it! Had to look nationwide to narrow down the options, but finally found the right combination an hour + away from home. Got all the option packages (@CarGurus you need this option for your search engine) we wanted, and found an acceptable color combination. Had to have Blonde interior, hate Black anything. Have you driven a 2017 Volvo XC60? The mirrors on my XC60 are not retracting when locking the car. It started yesterday. We've had a couple of days of temps in the teens. Not sure if that is causing the problem.